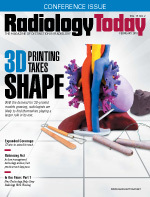 As the volume of imaging data continues to explode, radiology departments face an increasing number of workflow challenges. The good news is advances in workflow technology are helping radiologists resolve many of these issues. One improvement is the ability to share scans on the cloud as soon as they're ready. By doing so, imaging departments and centers can share their images and create worklists for their radiologists; all who need to read can do so wherever they may be located—whether on site or off. The old, time-consuming method of burning CDs and hand-delivering them to referring physicians or patients is fast becoming a thing of the past, says Carol Corder, ARRT (CV) (R), CRA, director of imaging services and noninvasive cardiology at Regional Medical Center Bayonet Point in Hudson, Florida. A little more than a year ago, Bayonet Point began using Mach7 Technologies' Enterprise Imaging Solutions to manage its image-sharing needs. Sharing images on the cloud has resulted in remarkable improvements to the organization's workflow, Corder says. "We provide our referring physicians or patients with a link to the images and results for their studies. We also share to receiving hospitals when patients are transferred for further care. The physicians sign on with their e-mail or e-mail shared account and enter their own password," she says. "This saves the patient repeated trips to pick up a CD, and the patient's physicians or receiving hospitals often can have results and images quickly." The medical center is also using this technology in its surgery department to view outside images for surgical cases, Corder notes. Peer review has been made easier as well, Corder says. The system enables imaging coordinators to assign cases more easily to the appropriate radiologists for second reads, she says, adding that in the days of film, radiologists would select random cases and hang them in their reading rooms. "Now we can assign them on a worklist, and the radiologist knows which cases he has to review," Corder says. Information about the radiologists' availability, specialty, and location is used to set up the worklists. Advances in workflow technology are also helping radiologists to "stay put," says Eric Rice, chief technology officer of Mach7 Technologies. "With the new technology, interoperability capabilities are much more advanced." Until fairly recently, he says, radiologists who read for different sites had to have separate workstations in their reading room for each one. It was possible that each system they read for had its own PACS, and the radiologists had to read that health system's scans on that system's workstation. So, they would get swivel chairs and literally slide from one to the other. Worklists were created for each PACS. "Now radiologists can sit at one workstation, and it's smart enough to know to launch the different studies from the different sites," Rice says. Because the viewers are vendor neutral, radiologists can work from one station and one worklist. Andrew D. Mills, MD, is president of Advanced Medical Imaging Consultants (AMIC), a radiology group based in the Fort Collins/Loveland area of Colorado. The practice reads for hospitals across northern Colorado, southern Wyoming, and southwest Nebraska. AMIC has more than 40 board-certified, subspecialty-trained radiologists who read close to 600,000 studies per year, serving 24 customers and more than 3,500 referring physicians. The practice uses Intelerad's InteleOne XE to manage its cross-enterprise reading requirements and workflow. With InteleOne XE, Mills, too, is able to leverage a single-user interface with unified access to patient images and information stored in all of AMIC's customers' legacy systems. Laurie Lafleur, director of product marketing at Intelerad, says its data show radiologists see 20% or more in productivity gains and are able to offer higher-quality results when they don't have to bounce between systems to read. InteleOne's XE analytics package also can drive continuous improvement and inform clinical and business decisions that help to improve workflow, Lafleur says. For example, when a radiologist clicks on a case, a template is automatically opened for that particular type of study, whether it is an MRI for the left knee, a DEXA scan of the heel, or another type of study. Mills says the feature makes it easy for him to check the components he needs to look for in each part of the knee or heel. Combined with dictation from Nuance's PowerScribe360, it makes reading and reporting scans a more efficient process, he says. Getting STATs read and reports out the door as quickly as possible was a significant workflow challenge for AMIC. In an effort to remedy the situation, several of the group's radiologists asked the IT department to create a separate worklist for urgent requests. "Our IT department created the STAT Control Module, and what it does is monitor our own internal website for the different sites we cover," Mills says. "It organizes STAT requests into a separate module screen on our PACS workstations. This allows us to prioritize STATs when they are submitted from all our sites. The radiologists who are reading can click on that STAT on the worklist and take ownership of it." When imaging service coordinators, who monitor the STAT requests, see a report in the queue, they alert the appropriate people on the referring medical team that the results are ready. Eliminating this step for radiologists is a huge improvement to workflow, Mills says. "I am no longer waiting to get hold of a doctor. Someone is doing it for me," he says, adding that this allows him to turn his attention to other work and studies while he waits for a referring physician to call and discuss the results, if necessary. "It is a much more efficient workflow system," says Mills, who notes that when the referring physician calls him back 10 minutes later and he's moved on to other studies, he has to stop and think, "Oh, yeah, that's what he's calling about." Not only has the STAT Control Module created workflow efficiencies for its radiologists, but it also has significantly decreased the group's response time to urgent requests. "We are able to have turnaround times of 15 to 18 minutes, which has become standard today," Mills says. Artificial intelligence (AI) is currently getting a lot of attention in the radiology space, says Steve Deaton, president of health care IT at Konica Minolta Healthcare Americas Inc. Many companies are touting workflow features as AI functionality. "In Exa, we have been developing and using intelligent algorithms that guide and improve workflow but not marketing it as AI," Deaton says. Currently, the Exa platform features algorithms that are designed to play an important role in creating workflow efficiencies, Deaton says. "For example, our workflow design engine enables customers to completely customize, and even automate, their workflow process. They can add any status they would like and arrange them with a simple drag-and-drop process," he says. "The best part is that the design engine ties back to Exa's real-time analytics dashboard, so you can see live if patient flow is bottlenecked or backing up in any particular part of their imaging experience," Deaton says. "Our customers have the ultimate control and visibility to workflow in one software platform." Exa's dashboard analytics package helps radiology departments and imaging centers keep track of their studies and the notifications they send. This information can be used to improve workflow, Deaton says. For example, the system sends out notifications to the front desk when patients are waiting for more than 10 minutes in the exam rooms. If the data show that the number of such notifications are much higher on certain days, the practice can analyze the situation to determine what's causing the workflow slowdown. "Maybe it's that the MRI technologists on Mondays and Thursdays are super chatty, and that's slowing down the whole practice," Deaton says. Envision Diagnostic Center, part of the Envision Medical Group, which has 10 locations outside Detroit, has radiologists that read a variety of scans including nuclear medicine, CT, ultrasound, and mammography. Michelle DeVries, administrator at Envision Diagnostic Center, says Exa allows her to customize worklists for the radiologists and cardiologists who read the scans. Some radiologists request that she make separate tabs for mammograms and rush requests. "We have levels of urgency that allow us to flag studies," she says. "That's very helpful for the readers." When Envision's technologists send studies to the PACS, the status of the exam is automatically updated on the radiologists' worklists. "If it's STAT, it goes to the top of the worklist," DeVries says. "If not, the radiologists will read them in the order they come in." The advantage to the practice is, once the exam is checked in, "that's the last time we have to touch it," she says. "It puts it right in the doctor's worklist. After the patient is checked in, there's no more touching of the patients beyond scanning." Mills says he looks forward to using AI to customize hanging protocols when reading exams. "That's coming down the pike, too, and very doable," he says, adding that he anticipates such a development would assist his workflow as well. This is an area that Intelerad is targeting with its recently released SmartLayouts, which streamlines the creation and sharing of hanging protocols, Lafleur says. "The solution also leverages intelligent automation to ensure that all future cases are laid out in a reliable and consistent manner, using a variety of study attributes and characteristics as well as each radiologist's reading preferences," she says. Calgary Scientific recently introduced its latest version of ResolutionMD enterprise viewing platform, which can be used in addition to PACS to make workflow easier, says Chris McIntyre, director of product management for health care at Calgary Scientific. "We're not designed to be a PACS replacement," McIntyre says. "ResolutionMD doesn't have all the things that a fully functional PACS has because it fits a different niche." It is intended to help radiologists streamline workflow by allowing them to access scans wherever they have an internet connection. With ResolutionMD, radiologists can call up scans on their laptop or smartphone while making rounds or when they are in the operating room or at the nursing station. With integrated multiple data sources and federated access, radiologists interconnect multiple EHR/EMR systems such as Epic, AllScripts, and Cerner. They can also pull in data from multiple vendor-neutral archives and PACS to enable access to entire patient records in one query, saving time and effort. One of the keys to making workflow more efficient, McIntyre says, "is removing the nonvalue-added steps a clinician has to do." Mills agrees that when technology takes over some of the reporting and recording tasks, it gives radiologists more time to look at the images and apply their expertise. Some of the housekeeping tasks can cause work to bottleneck and "once you've figured out how to get around that, that's huge," he says. Marco Gonzalez-Castellon, MD, an assistant professor in the department of neurological sciences at the University of Nebraska Medical Center, says ResolutionMD has greatly improved workflow because "you don't have to find or be at a workstation to be able to see the scans and report when they're ready. When the [emergency department] calls us for an acute consult, we can be anywhere and, as long as we have access to a 4G network, we can call up the scans and see enough information to help make decisions about the patient's care." According to Deaton, "As pressure mounts with the uncertainty of reimbursements, it is important to depend on IT solutions to automate workflow and improve efficiency." Unfortunately, he says, this is a concept many health care facilities still do not embrace. "Many systems were implemented as a software solution to replicate existing workflow processes, but the workflow must also evolve," Deaton says. Technology can help make it so. Next month: How improved scheduling benefits workflow.